Press the rear defogger and heated door mirror button to defog the rear window and mirrors when the ignition is in ON . The rear defogger and heated door mirrors automatically switch off after 10-30 minutes depending on the outside temperature. However, if the outside temperature is 32°F (0°C) or below, they do not automatically switch off. When cleaning the inside of the rear window, be careful not to damage the heating wires. It is critical to wipe the window from side to side along the defogger heating wires. This system consumes a lot of power, so turn it off when the window has been defogged. 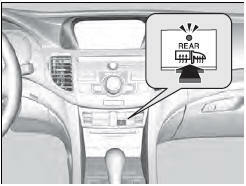 Also, do not use the system for a long period when the engine is idling. This may weaken the battery, making it difficult to start the engine.